When a figure is foreshortened you can’t believe what you’re seeing. Literally. You deny the reality in front of your eyes. It’s just too weird, too funny. That’s because the forms are compressed and overlapping. So, instead of drawing what you see, you “fix it.” You stretch everything out. When you do that, you ruin the magic. But you do it anyway, most of the time. Andrea Mantegna (1431-1506) tried and failed. He posed his model and then he went into denial. Can’t be, he said to himself. Not only did it look weird and funny—not allowed in 1490—but he had to contend with certain cultural values, which were also his own: the head is the seat of reason, it’s where kings and popes wear their crowns, it’s where the “windows to the soul” are, important people sit at the “head of the table,” and therefore the head had to be big; the feet are at the opposite extreme from the head, are down there, are filthy, are base and therefore have to be shown to be unimportant, small. The basic assumption here is that big = important, small = unimportant. 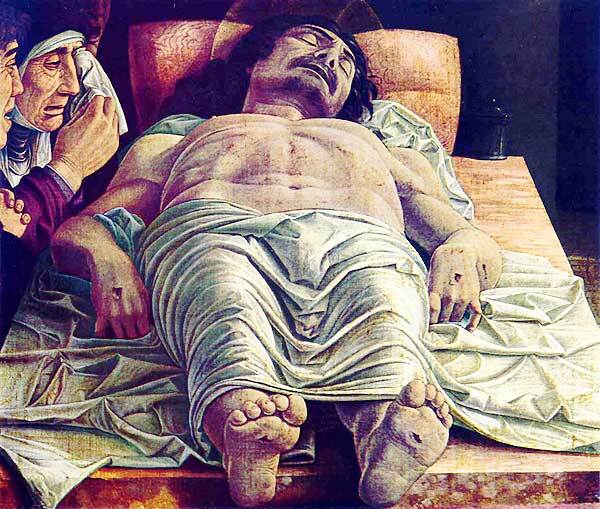 The Christ figure should look very much like the guy napping in Millenium Park (above), but Mantegna couldn’t overcome his big-small value system. 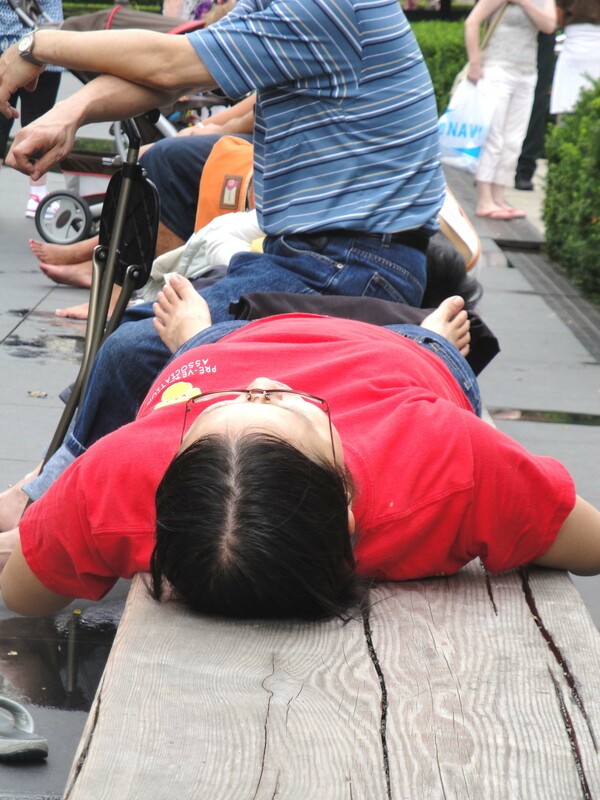 Even when the napping figure in the park is shot from a higher vantage point, the feet are still large and the head is still so tiny that the umbrella on the chest obscures it. A contemporary of Mantegna’s, Albrecht Dürer (1471-1528) left us an illustration of a device that artists could use to force themselves to see what’s actually there in front of their eyes. Basically it’s a piece of glass positioned vertically, so that the artist can just trace what’s on the other side of the glass. Not so easy. The work presumes that you hold your head steady. To this end, you have a vertical column that reminds you where your eye has to be at all times. This device was, no doubt, an excellent pedagogical tool for learning how to overcome the weird cultural bias that kept you from SEEING. I don’t know anyone who uses it today. Today we just go to class and LOOK and remind ourselves that weird is wonderful. 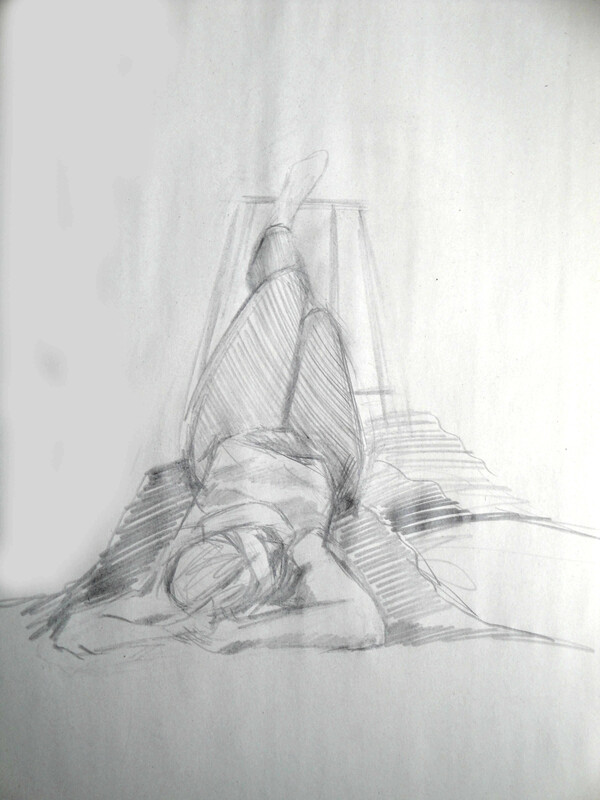 In this student drawing we can see that the torso is compresses and the limbs really are drawn as overlapping forms. The resulting drawing by Cheryl B. is schematic, but honest. 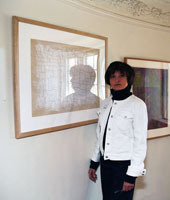 Here the head, being closer to the viewer, is drawn large and the feet, being far away, have to be quite small. It’s easy to say all this, but drawing a figure in this pose is difficult. Everyone should draw foreshortening… accountants, pilots, radiologists , lawyers, et al. I recommend it highly because this exercise confronts you with the challenge of seeing WHAT’S REALLY THERE. Again, Millenium Park offers the lesson from reality.